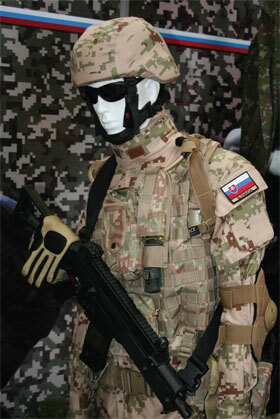 Slovakia's Prokrocily Individualny Bojovy System (PIBS) or Advanced Individual Combat System began life in earnest in 2004 with a three year Concept Development and Experimentation Phase. A further test and evaluation phase took place which began in 2007, with 2009 being the last time that squad level PIBS testing using an experimental ten man system took place. Under the original PIBS schedule the plans were to deploy PIBS ensembles from 2012, sufficient to equip a single three battalion strong brigade plus supporting units, roughly 2000 systems in total. The Ministry of Defence's contractor was local company Magic Training Corporation, working with international prime contractors. However, while the PIBS programme per se has ended or at least entered an extended hiatus, outputs and findings from the five years of work have at least, led to activity that should produce procurement in some areas of soldier modernisation. Earlier in PIBS schedule, a new weapon was planned to be acquired from 2011. Work under the aegis of Magic saw candidate Soldier Modernisation Programme ensembles brought in for testing in Slovakia. These were based around C4I solution from Germany's Infanterist der Zukunft from EADS/Cassidian, including the SOLAR 400E communications system, sourced from Thales Germany and thermal surveillance equipment from Sagem, the latter issued on the basis of one per squad. In the personal communications role, Slovakia currently fields a mix of Elbit PNR-500 and Harris RF-7800S radios but which are not issued to every unit. Earlier this year, the first elements of Slovakia's BKRS (Bojovy komunikacny radiovy system) integrated combat communications system entered service. This is a BCV-2/BMP-2 mounted system which uses used Elbit's CNR-9000 VHF and HF-6000 HF combat net radios. Changes are nonetheless going ahead with other areas of soldier modernisation such as new uniforms which implement a digital camouflage design in desert and woodland colour schemes. Another future of recent modernization is development and fielding of a new load carriage system or NMS (Modular Carriage System). This consists of a new combat vest, backpack in 30 and 60 litres, hydration system and pouches. The system uses a combination of vertical and horizontal fasteners in a MOLLE approach. The system has been designed to operate with the new uniform and is also compatible with legacy ballistic and a CBRN protection system. There are two load carrying alternatives using NMS with the combat belt being affixed to the combat vest. NMS is also compatible with NATAO STANAG 2311. The system is offered in both woodland and desert print camouflage patterns. The Slovakian armed force use the new RHB303 AU Protective Ballistic Helmet ballistic helmet which is an Aramid based solution built to the MICH/PASGT pattern and meets NIJ 0106.01 and 0101.04 Class IIIA requirements and also protected against low speed hits, being compliant with EN 397. The protection provided by the helmet is also compliant with MIL-STD-662 and STANAG 2920. The system has also been designed to ensure compatibility with SIMRAD GN 2 night vision goggles which were also used in the PIBS trials. Comfort features on the RHB303 AU helmet include a four point chinstrap and the helmet is adjustable to multiple head shapes while also allowing suitable ventilation. Another recent protective clothing solution are new combat boots for overseas deployments. These feature chrome tanned water repelling leather with the winter variant also including a textile lining insert, designed to remove perspiration from the surface of the foot. The internal material uses a Gore-Tex membrane and has internal shock absorption with the shoe also being resistant to fuel.